For the SECOND TIME Vuesch – Verein zur Überwindung der Schwerkraft e.V. 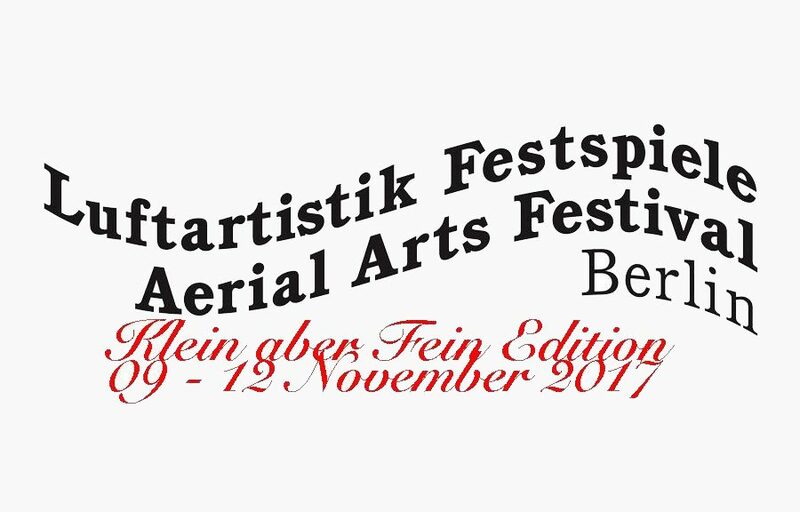 (our Berlin training space for circus) is organizing the Aerial Arts Festival Berlin! 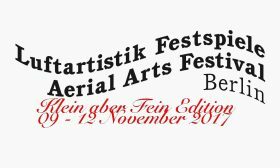 This year will be our “Klein aber Fein” edition – with a less, but even more interesting actions than last year!!! ? Our main partner this year is Pfefferberg Theater, where we will show all our performance programm. Again we are lucky to tell you, that Maulhelden Büro is supporting us again, together with Arnulf Rating, our patron. Workshops will take place in our own space at Vuesch, as well as at our partner spaces Vuesch gGmbH / Circus Schatzinsel and Q Space! All workshops will be two-day workshops (á 3-4h a day) this time – so there is more time to work with one teacher, and to go deeper! This space (for those who do not know it) is not even close to the size of the space where we were last year. All in all we have 6 rigging points. So this means open training will be a lot of sharing. But we do not have a curfew – so we can jam as long as we want (well maybe until 23h…). We have three night of winderful aerial shows at a real theater! Two nights will be a long feature performance, and the third night will be a gala with more artists! Very excited about our line up!!! The workshops and training are aimed at the aerial community – professionals, semi-professionals and advanced aerial lovers! We welcome everybody, but we do not offer any beginner’s classes or beginner’s training at all (sorry beginners… keep working and you can join us next year!!!). – is at least 18 years old. The shows are open for anyone, of course! Tickets for the shows in Pfefferberg Theater have to be booked directly at the theater – we are part of their official program! But as a participant you will get a reduced price for the shows! If you need to discuss anything, are looking for a place to stay, have questions about workshops etc. – we made a Facebook Group for the participants, where you can post things like that! We will offer props to work on, as this is a lot smaller edition than last year (or next year!). That means there will be silks, lyras, ropes and trapezes. If you want to work on something else, please bring it – together with steel carabiners, svivels and what else you need. You do not need slings, as we rig directly into our rigging points. Never forget, this festival has a sharing spirit – so when you bring your own material, you will have to share with everybody (If you don’t want that, don’t bring it…). And of course respect all the equipment (e.g. if a rope does not allow doubles, don’t do doubles with it…). Vuesch – Verein zur Überwindung der Schwerkraft e.V.